Nest Record Scheme (NRS) Mentors are experienced nest recorders who are available to be contacted for advice and training. 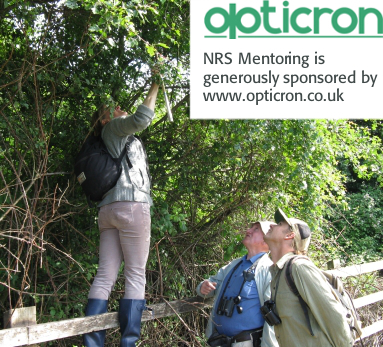 Mentors can help new NRS participants get started, give training to existing recorders on monitoring certain species, and demonstrate nest recording to those wanting to find out more about the survey. Along with NRS materials and training courses, mentoring is a way for NRS participants to develop the skills needed to carry out nest recording to a high standard. A mentor can provide help ranging from guidance over the phone to meeting up in the field for training. A new nest recorder, for example, will typically contact a mentor for a 1-2 hour introductory session in the field. Please bear in mind that mentors are volunteers themselves, so their availability may be limited. Also please note that not all mentors have registered to train people under 18-years-old. For more information on mentoring, please see this FAQ. If you have any questions, please nrs [at] bto.org (email us). Use the map below to look up NRS mentors in your vicinity, bearing in mind that you will be travelling to meet them. Clicking on a pin brings up more information about a mentor, including what species and types of nest recording they specialise in. To contact a mentor, click on their pin and select ‘Contact this mentor’. You will be asked to provide contact details and, if you are under 18-years-old, your date of birth. Usually, a mentor will get back to you within 2 weeks.